The Christopher Hills Foundation (CHF) has been a non-profit 501(c)3 organization for 38 years. Our goal is to carry forward Christopher Hills’ vision of a world free from hunger using sustainable technologies to advance humanity. Christopher Hills' legacy is as a thinker and writer but in reality he was very much a doer. He harvested, cultivated and popularized spirulina, unique for its incredibly high protein and enzymes. Cyanobacteria seed cultures developed by Christopher Hills and his partners have benefitted millions of hungry refugees, helped people lose weight and even fed astronauts in space. How can such a simple organism be so revolutionary? It helps to look back to the story of algae and its role in creation of life on Earth. 3.5 billion years ago our planet was a primordial lifeless orb of dust and gases that had one big asset – the neighboring sun. From the solar light came Life. The earliest life forms were bacteria and from these emerged single cell algae that learned how to split themselves and multiply. Blue-green Spirulina and its algae cousins were so prolific they bloomed in the oceans gobbling up carbon dioxide that was prohibiting respiration while exhaling the oxygen that allowed new life forms to develop. Plants, trees, forests evolved and so did fish and reptiles that fed on them. The algae was so nutritious it propelled brain development in animals and eventually humans. The Mayans knew its value and farmed it as a subsistence crop for hundreds of years. Every strand of spirulina carries this ancient legacy of life. Since 1958 Christopher Hills and his biologists grew it in ponds around the world using algae as a solution to hunger and recently as an alternative to fossil fuels. Just as algae created life, so now it can save it. Algae can provide nutrition where arable land is scarce or if traditional crops fail due to drought or over-zealous genetic engineering. Algae can provide a renewable fuel as oil runs out. Algae, with its super nutrition, antioxidants and enzymes can save our bodies from disease, especially here in America where out of 180 nations we are a mere 70th in wellness. The Christopher Hills Foundation researches these opportunities and is innovating solutions for humankind’s future. 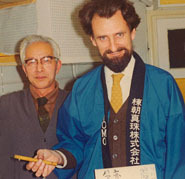 London 1967 -- Dr. Hiroshi Nakamura with Christopher Hills planning Ethiopia expeditions to harvest first spirulina seed cultures. Many of today’s Spirulina aquaculture technologies had their roots in the experiments of these two scientists. Joining forces in 1958 and forming Microalgae International Union in 1963, they saw the potential for algae as a miraculous superfood, investing tens of millions of dollars in research and development. The scientists' expeditions to African lakes brought back samples of pure original wild spirulina strains which they hybridized and refined for adaptation to temperate U.S. climates. In this website we are making the research of these "bioneers" available to all who aspire to sustainability, health and nutrition. Our goal is to further the cultivation of algae as a food and fuel of the future without regard for profit. Each of these men had their particular fascinations. Christopher Hills’ intuition that algae’s bioactive carotenoid pigment colors and antioxidants were a key to curing cancer were borne out in his Harvard Medical School research. Like Einstein, Dr Nakamura saw science through the prism of Nature’s mathematical mysteries and marveled how the spiral helix descended from the shape of galaxies down to Spirulina’s microscopic chromosomes. The goal of CHF is to share these scientists' discoveries and support their vision of a hunger-free world. Today millions of people around the world enjoy the health benefits of spirulina. The scientific aquaculture research and intitatives of Christopher Hills spanned the globe for forty years. 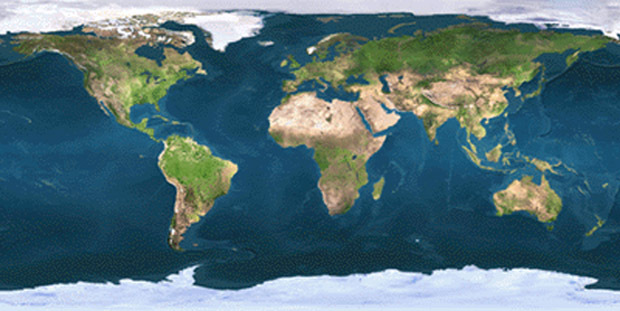 Roll over the geographic points to view projects in each country. In the early 1950s the algae Christopher Hills was focused on was the green goop he had to scrape off the hull of his yacht Robanne. A successful businessman living in tropical splendor, he was at one time Jamaica’s largest exporter of agricultural commodities such as Blue Mountain coffee, pimento, nutmegs and ginger. 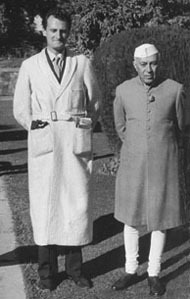 Christopher Hills with India Prime Minister Jawaharlal Nehru, New Delhi 1962. They worked together to bring algae cultivation to India for famine relief. In fact light became his obsession – the light of consciousness, imagination, its rainbow of color frequencies and how it could produce a new source of food was deeply researched in his 30 books. On a world tour where Christopher Hills had spent two years traveling the length and breadth of India studying yoga and meditation he witnessed starving children in villages hit by famine. 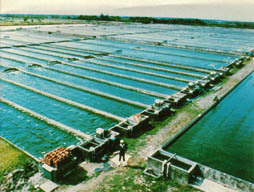 India’s Prime Minister Jawaharlal Nehru became his patron in designing algae cultivation for India so the subcontinent would not have to face hunger again. 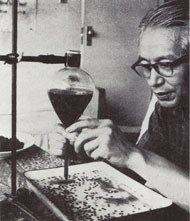 Dr. Hiroshi Nakamura producing edible chlorella peas and chlorella spaghetti via his patented method of coagulating the algal suspension. He built a laboratory at his home in Jamaica’s Blue Mountains and formed a lifelong partnership with Dr Hiroshi Nakamura one of Japan’s foremost aquatic scientists and a friend of fellow microbiologist Emperor Hirohito. 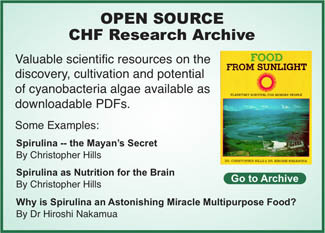 Dr Nakamura saw algae as a potential miracle food, a way of sequestering carbon dioxide and as a future fuel. The two scientists set out to reproduce on land the flowering of the oceans that had transformed our almost lifeless carbon dioxide polluted planet into the GAIA jewel incubating millions of new species. Together they pioneered cultivation of chlorella and spirulina from original seed cultures they had collected in African and South American lakes. Taiwan microalgae factory produced $10 million in Spirulina powder for Japan Light Force Co. Ltd which grew to 15,000 distributors in Asia. The National Enquirer reporting on America’s enthusiasm for spirulina published a story headlined “Miracle Safe Diet Pill”. Light Force sales skyrocketed and there was not enough spirulina to meet demand. Christopher Hills found himself traveling the world contracting with aquaculture farms to grow thousands of tons of spirulina. The first farm was Light Force Taiwan set up by Dr Nakamura's protégé, Dr. Kotaro Kawaguchi. 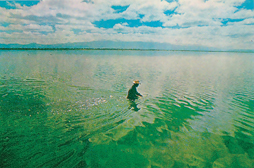 Later, as sales mushroomed in the United States, to reduce shipping distances Christopher Hills persuaded the Mexican government to export spirulina via a joint venture with Sosa Texcoco, harvesting its enormous natural lake just outside of Mexico City. Driven by a vision of algae foods “greening the deserts” he also partnered with Koor Foods to grow spirulina and dunaliella in Israel’s Negev desert at the mouth of the Red Sea. Still resolved to do something about the hungry and disadvantaged he created the Christopher Hills Foundation to plow profits into worthy causes. A Sosa Texcoco worker harvests Spirulina from the vast Lake Texcoco in central Mexico. It is believed the lake provided nourishment for ancient civilizations. Over a period of thirty-five years CHF funded a panoply of charitable projects. The most ambitious initiative was the acquisition of 150 acres of land in Desert Hot Springs, California to research and farm spirulina on an industrial scale. At Green Gold Farms the Christopher Hills Foundation built a state of the art research laboratory and the first solar boosted spray dryer. The cutting edge laboratory was run by two of the world’s leading algae scientists – Dr Kotaro Kawaguchi and Dr Sebastian Thomas who is currently head of India’s biggest spirulina producer, Parry Agro .